If you're working through the series in anticipation of Borderlands 3, don't skip these DLC missions. There are 47 pieces of DLC for Borderlands 2 on Steam. 47! That includes a whole mess of skins, but also some meaty expansions, like Captain Scarlett and Her Pirate's Booty and Tiny Tina's Assault on Dragon Keep. If the announcement of Borderlands 3 has sent you journeying back to the Pandora of Borderlands 1 and Borderlands 2, you're not alone—I've been replaying them to figure out which bits of DLC are actually worth the time to play. What about Claptrap's Robot Revolution from the newly-enhanced Borderlands 1? Or the Zombie Island of Dr. Ned? Even the Pre-Sequel had a season pass. Will you regret going on a Claptastic Voyage or fighting through the Shock Drop Slaughter Pit? I've played them all to determine which ones are fun and which, bless their hearts, are entirely skippable. Here are the best Borderlands DLCs, with some guidance on how and when to start them during each game's campaign. The Secret Armory of General Knoxx was a taste of things to come. It's the moment where Gearbox hit on the tone that would become the defining feature of Borderlands 2—it has a villain who contacts you frequently over the ECHOnet to shoot the breeze, and the dialogue suddenly gets funny and gives characters like Mad Moxxi and Scooter actual personalities. As well as having better writing, it gave the series its first raid boss—a giant crab worm called Crawmerax the Invincible balanced to be an endgame challenge for groups of max-level characters. Raid bosses designed to demolish you would become a mainstay of the series. In addition to all that, it tried to overcome the Borderlands problem of being too spread out by making vehicles even more prevalent and adding new ones—a superfast rocket car, a carrier designed for four, and a monster truck. It's still more spacious than it needs to be, but it tries. Finally, the armory itself is a lootsplosion that makes all the hard work it takes to get there feel worth it. It's the original Borderlands' one truly essential add-on. Of all the DLCs released for Borderlands 2, this is the unmissable one. 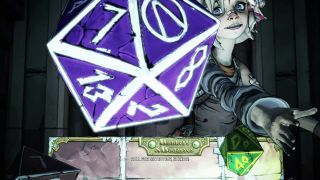 A D&D-themed expansion in which the Vault Hunters take part in a game of "Bunkers & Badasses" being run by Tiny Tina, it's both a send-up of fantasy cliches and a series of spot-on jokes about the kind of D&D games teenagers run. At the same time it's a retelling of Borderlands 2 through the lens of a different genre that acts as a weird kind of therapy session for the characters who've survived it. Like a lot of Borderlands 2 it presents you with a mountain of silliness, then when you climb to the top it surprises you with legit character development and emotional pay-off. If you care more about guns, Dragon Keep has a couple of the best in the game. The Grog Nozzle is a pistol that heals you for a percentage of the damage you cause, even if that damage comes from other sources—like grenades. The SWORDSPLOSION!!! is a shotgun that shoots a sword, which explodes into several other swords, which also explode. It's the most Borderlands gun there is. A desert full of pirates and sandworms where you can fly around on vehicles modeled after the hovering skiffs from Return of the Jedi? It sounds amazing. And it would be an easy recommendation if it weren't for the fact that Captain Scarlett and Her Pirate's Booty doesn't have an ending to speak of and just kind of stops. Still, it introduces some fun characters like Scarlett herself and Shade, a lonely desert hermit who pretends mannequins are his friends (and who shows up again in Tales From the Borderlands). The other comparable expansion is Mr. Torgue's Campaign of Carnage, which is balanced for the same levels. It's a bit more filler-ish, however, with missions that send you back through the same area in the opposite direction or just feel like padding. If you're a big fan of Mr. Torgue shouting about explosions that might bump it up above Captain Scarlett, and it does have good loot. Normally the beach episode is an excuse for a certain kind of fanservice. The Borderlands equivalent is less about bikinis and more about rewarding long-term player commitment with a last hurrah for its world. The fifth headhunter pack DLC, Sir Hammerlock vs. the Son of Crawmerax, includes a boss fight against the son of the original raid boss from The Secret Armory of General Knoxx (balanced to be defeatable solo this time), and after that there's an epilogue in which villains from each character's past try to get revenge. The dialogue's full of callbacks and references too, the Borderlands series being nostalgic for itself in a gleefully self-indulgent way. The headhunter packs were smaller DLC stories designed as budget additions to Borderlands 2, each themed around a holiday. Of the others How Marcus Saved Mercenary Day has some good loot though it feels pretty slight, and Mad Moxxi's Wedding Day Massacre has a fun story about helping feuding hillbilly clans settle their differences. One last Borderlands 2 DLC to note is the Ultimate Vault Hunter Upgrade Pack, which increases the level cap by 11. It's worth it for your True Vault Hunter Mode replay, because otherwise you'll hit the level 50 cap well before the end of the storyline, especially if you're diverting into DLC missions along the way. The Pre-Sequel didn't get much DLC, but this one campaign add-on is worth trying. It sends digitized versions of the characters inside Claptrap to track down valuable secret plans that have been hidden in the annoying/delightful robot, and it includes a trip through his memories—like a glitched-out recreation of Fyrestone, the first hub from the original game. It builds to a conclusion that bridges the final gap between the Pre-Sequel and Borderlands 2, kind of like the finale of Star Wars: Rogue One. Fans will lap it up. If you hate Claptrap you should totally skip Claptastic Voyage, but if you like the little guy you'll appreciate this.